Guy Verhofstadt, the leader of the liberal ALDE group in the European Parliament, told MEPs that the creation of a European intelligence agency, as well as a corps of European border and coast guards, is more urgent than ever. At a debate in Brussels on Wednesday (18 November), the Belgian politician focussed on the situation in Syria and the fact that France had broken new ground by activating article 42.7 of the Lisbon Treaty. “The activation of article 42.7 is a development that passed largely unnoticed, but that is of fundamental importance. Previously we would have invoked article five of NATO or article 222 of the Treaty of the EU, which concerns domestic security,” the MEP said. Verhofstadt believes the activation of article 42.7 necessarily implies the creation of a European coalition that other states can contribute to. Verhofstadt argued for the latter solution, which will be examined at the last European Council of the year, in December. For now, Greece and Sweden are opposed to the project. “But these decisions have to be made. How many tragedies do we have to suffer before we make them?” he asked. The Liberal leader also reaffirmed his support for the proposed creation of a European passenger name record system for air passengers entering or leaving the EU (PNR), under discussion at a European level for the last two years. “Our group agrees, but we want an agreement on data protection in return; if we collect data so easily, we also have to protect it,” Verhofstadt said. The right wing of the European Parliament has accused the other political formations of blocking the PNR project. The asylum system was also among the EU policies the former Belgian prime minister picked out for urgent reform; he said the Dublin Regulation was anti-European. “The fact that countries bordering the Mediterranean have to register all the refugees is not solidary. Obviously they don’t do it, they can’t do it,” he said. More EU is not the answer currently the Commission and its Legal functionaries have infantilized capable national authorities. The Commission and its legal thugs are the problem. 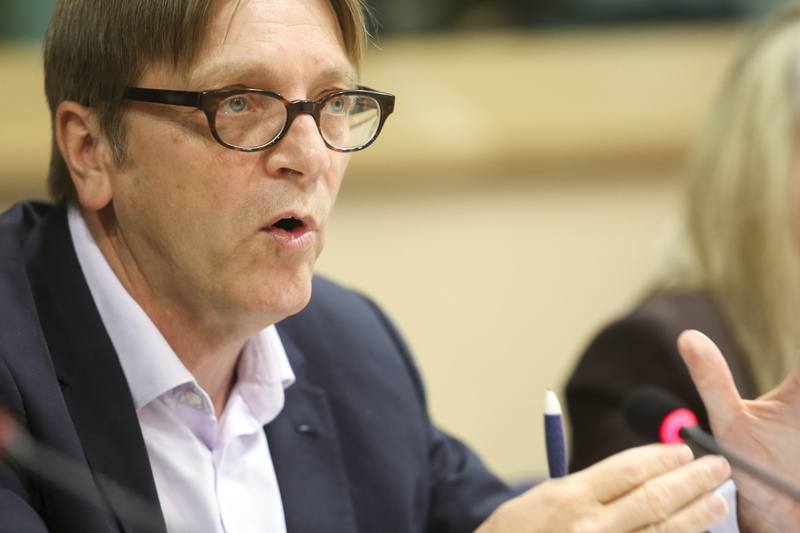 Guy Verhofstadt only has one answer for any problem, more EU. Article 47.2 as I am sure he is aware is intergovernmental in nature while Article 222 would engage institutions of the EU as well. The fact that France is using 47.2 shows clearly that they do not want the institutions of the EU to have any role. Contrary to the comments of Mr Verhofstadt Article 222 has never been invoked, to claim otherwise is just wrong. The creation of an effective European intelligence agency would take years. The call also entirely fails to acknowledge the existence of the Five Eyes Agreement in which the UK is engaged but no other EU power is, nor are they likely to be. That being the case while enhanced information sharing may be entirely possible, the establishment of a single agency really does not seem practical. Certainly the idea of MI5 and MI6 being subsumed into a pan EU intelligence agency would seem to require an entirely separate UK referendum under the European Union Act 2011 as it would seem to be passing significant powers to the EU. Good luck persuading UK citizens that they want the intelligence agencies to be run by Brussels. You already have Interpol and lord knows how many other agencies and organizations. This is simply a tool to further entrench the euro experiment. More Gun Control was also announced today. Government has one job, and it is to grow and protect itself. One single EU intelligence agency is desperately needed now and in future because the European Union’s domestic security IS threatened . The 28 multiplexed incompatible systems don’t work a corn ! For the the security for all European Union citizens the E.U. must implement immediately the European passenger name record system. If not don’t blame yourself because you die by a bomb because just of this security lack !! The most interesting aspect is that the weakest link is Belgium through which the islamist terrorists pass backwards and forwards with impunity. Now do remind me which nation was Guy Maurice Marie Louise Verhofstadt a politician and former President of? This Topic is only about a Creation of an EU intelligence agency ! Either you like or don’t like it moron! Your EU is the root cause of the misery, mass unemployment and now security threats faced by people in the Nation States in the EU, only a fanatic would demand more of the same. Please do not call us ‘European Union citizens’, it is not a label we have asked for and find it insulting. Arshole ! No you treally are one ! “British Citizens” doesn’t it exists ? Oh dear, is the little ‘an european’ fanatics pipe dream falling apart. Do you think the French people will leave your pointless EU before or after us ? Via EU dogma Brussels has destroyed the economies of most of the countries using the Euro & the terrorist passport known as Schengen is a threat to everyone so why would anyone hand their National security over to the same people ? End Schengen, End the Euro, End the madness. END the British Wesminster dictatorship , The Sterling Pound , End The madness and give Scotland Freedom back !!! The Scot’s voted to stay in the UK knowing full well we are leaving your pointless Eu, please try and keep up. Guy Verhofstadt is right, get rid of the dim wits that are now running the show and replace them with intelligent people. British Eurosceptics here in high revs today giving hands each other hands ! WoW ! Little Englanders mentalities weakens if it comes to security of the European Union . In reality Those stupid “british” mentalities here only gives a real chunk on it ! They are only interested to have a weak Europe and tries to maintain it’s ego proudness on head ! Those people only wants to remain to be powerfull ! in reality those colonialists begins to fear Europe and seems to see themselves in disadvantages . Do you mean the 50 countries of ‘Europe’, the 28 counties of the EU, the 26 countries of Schengen or the 19 countries of the Eurozone ? But thanks for the rant, it’s very amusing.